Celebrating 30 years in business, Tiger Oil is a family-run oil distribution company supplying home heating oil, marked gas oil (agricultural/ green diesel) and DERV (road diesel) in the greater Drogheda area. Tiger Oil has been providing tailored solutions to meet the needs of hundreds of customers since it was established in 1987 by Dermot Gaffney. Over the past three decades, the company has earned an enviable reputation for the quality of its products and customer service. Specialising in domestic oil services, Tiger Oil continuously endeavours to provide its clients with a flexible, prompt and personal service. Whether you are looking to fill your entire tank or just top it up for the season ahead, Tiger Oil has you covered. Since Dermot’s retirement three years ago, his son-in-law Michael Grogan has continued to drive the company’s growth and expansion with the help of his wife Karen and brother-in-law Robbie. Completing the Tiger Oil team is Michael’s sister Linda Fagan. “It’s a real family affair,”Michael smiles. “Karen and Robbie are sister and brother, as are Linda and I. Dermot has taken a backseat in the last couple of years, but his advice, support and experience remains invaluable. I joined the business in 2003 and Robbie, who’s a plumber by trade, has been a great addition since coming on board two years ago. We pride ourselves on being a family-run and independent company specialising in oil services for domestic home heating and commercial vehicles. Tiger Oil’s professional staff are on hand to assist you throughout the entire process. Its expert consultation service will see you on your way to filling you oil tank with the correct oil at the right amount to suit your budget. The firm offers a range of products and service from its office and depot at Boyne Business Park in Drogheda, selling kerosene oil, marked gas oil and diesel from its three pumps. Tiger Oil is also the only supplier in the bustling Co. Louth town to provide customers with a ‘fill your own’service for kerosene oil. 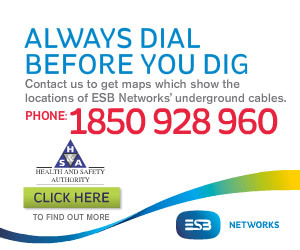 “Our continuous commitment to providing our customers with a premium service is unrivalled,”Michael explains. 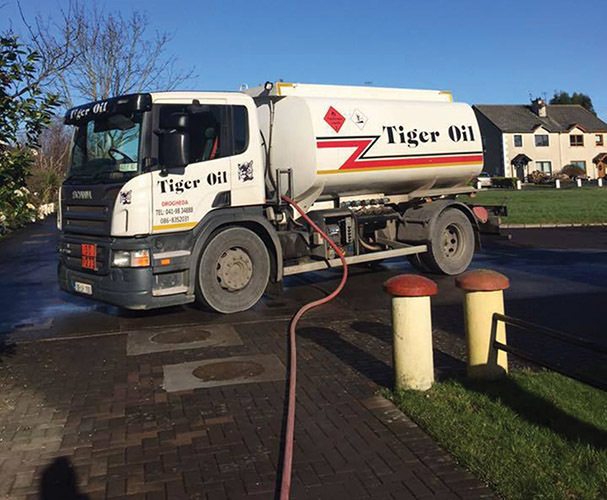 Tiger Oil runs two delivery trucks which serve customers within a 20-mile radius of Drogheda, taking in much of Co. Louth as well as parts of Dublin and Meath. Recently, the company took delivery of a brand new Scania P320 from McElvaney Motors, complete with a 13,500-litre tank body which was built by Road Tankers in Armagh. Both the new truck, which replaces a ’99 registered Volvo FL6, and the existing Scania P230 are installed with electronically controlled metering systems which record the exact time of start and finish of each delivery, guaranteeing received quantities. At 60c a litre, including VAT, Michael believes kerosene continues to represent excellent value for money for householders. “The price of oil may have gone up in the past year, but it’s still the cheapest way to heat your home. At the moment, you can buy a 1,000 litres of kerosene for €600. That’s very reasonable when you break down the figures,”he says. Tiger Oil has come a long way in the last 30 years and continues to go from strength to strength by ensuring its customers always receive a superb quality service at keenly competitive prices.